Wildchemy is a brand new slot that has landed at Maria Casino. Word about the five-reel cartoon cascading slot is spreading like wildfire – and you can join the exclusive fun from today with a £20,000 lucky spin tournament! 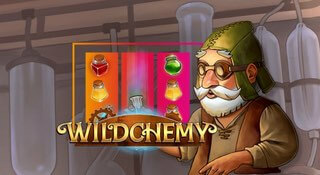 The Wildchemy slot theme is the potions, jars, vials and scales of an old-fashioned laboratory. Pyrotechnics means payouts – and the more you make each spin, the closer you are to this tournament’s £3,000 top prize! Can you feel the excitements bubbling up yet?